A full kit of components to allow the easy retrofit of most paper guillotines. All parts are supplied from the controller and electrical kit to pulleys and belts. A machining service is available should you require pulleys to be bored and broached to specific sizes. Aux Cable for Estop, Air etc connections. All cables are terminated to plugs to enable a quick and easy installation. As all systems are tested complete before they ship you can be assured that installation is a smooth process with minimal setup time required. 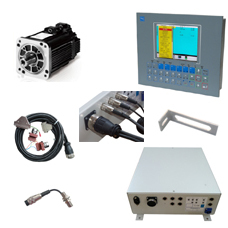 * Please note that all current AC SERVO Procut kits require a minimum of 200V to operate. An arm mounting POD for housing 5.7" controllers allowing them to be mounted on flexible arms and pi..
Adjusts for tilt (up-down), rotation, pan (left-right) and reach. One piece construction requi..